The following purchases will be made in my taxable account on Tuesday morning. This should yield around an average of ~3% for $1270 invested. It is important for investors to know what holdings in their portfolio are Core and what are Speculative. Core positions should be looked upon as the foundation of one's portfolio. One should not sell these positions but instead add to them whenever they are decently priced. Core positions offer safety and consistency in dividends and dividend increases. The Core positions are not expected to garner out-sized gains, however they can still provide decent gains over many years of compounding. The Speculative positions help in improving gains but introduce volatility. There is also a chance that the Speculative position may cancel or decrease their dividend. Below is a description of how I decide what is high quality and what is lesser quality in my portfolio. In the portfolio below, Green Tickers signify what I consider "Core", Yellow Tickers are supporting positions, and Red Tickers are speculative. I consider companies to be "Core" if they have predictable earnings, are non-cyclical and anti-recessionary in nature, have wide moats, demonstrate predictable dividend histories, and have strong credit ratings. I want to stress the point about having consistent earnings and being anti-recessionary. Many of the business I consider must haves are businesses that produce goods and services people need no matter the economic situation. When a recession occurs, we will still need to buy medicine when we are sick, use toilet paper, pay for electricity, consume food and drink, and wash ourselves. My portfolio aims at getting the dollar that people have to spend everyday, whether they like to or not. Companies that are "Core" and satisfy the 4 criteria above have their entire row in Green and their Ticker bolded, and I call these my Elite collection of high quality stocks. I am always on the lookout to add to these at fair value or less. These positions make up the foundation of my dividend growth portfolio since I do not see them going out of business anytime soon. Companies can meet the first 3 requirements (very high scores for credit rating and safety) but fall in an industry I am not too fond of. Some examples of stocks that I own are CVX, DIS, and TJX. Chevron is an oil major that is incredibly strong but I still see it as a risk due to the cyclical nature of oil prices. The only oil major I will count on is Exxon with its proven history and AAA credit rating. I consider Disney to be speculative because of its lower yield, discretionary nature (do we really need entertainment to live?? ), and my perception of the company as a growth stock. TJX is labeled as a Speculative position because I do not completely trust retail, and I own it purely for capital gains despite the meager dividend (which I must add grows rather quickly). One can never be too comfortable with retail when we continuously hear of the cancerous giant called Amazon. An investor needs to do their due diligence to decide if a company is really something he or she is comfortable owning despite the strong ratings. Companies that turned sour (dividend cut, fraud, or destruction in fundamentals) which I have held in the past but eventually sold would all be classified under the Speculative or (more generously stated) Supporting category from the rules defined. These include KMI, ARCP, and SDRL. I have sold each of these at an average of a 20%-30% loss. There are definitely other "Core" positions in my portfolio, but they do not qualify for the Elite status because they have lower safety or lower credit rating due to their debt, company size, type of business, cyclical nature, less predictable earnings, dividend history, or whatever other factors. 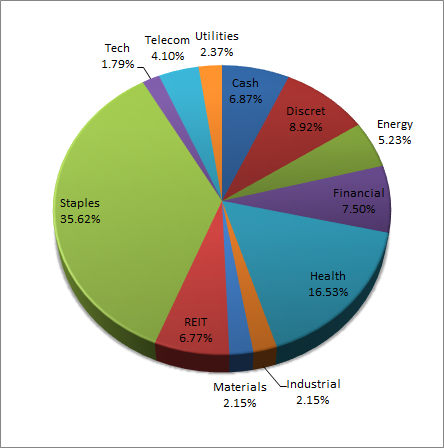 Currently in the portfolio below "Core" positions (which includes the Elite) occupy 72% of my portfolio. To be more specific, Elite positions occupy 27% of my portfolio. Hence the majority of my holdings are companies that I want to buy and hold forever. Speculative positions only occupy at the moment 9% of my holdings. Today, all the major indices saw increases but MMM had a large 6% decline on decreased guidance. 3M is my favorite industrial and I always wanted to add more but the price is always high. At the moment it is sporting a 2.77% yield. It's still over my price point, but it's worth considering. I like 3M above a 3% yield. The Fed announcement about their decision to hike rates will be coming very soon, and may spike volatility in the market which may open large opportunities in high quality stocks for investors. When stock market sentiment goes bad, many investors who own index funds will sell. And index funds hold everything from junk to high quality names like 3M. People will throw the baby out with the bath water during panic sells, and buying quality companies that have unchanged fundamentals are best done during these times. 3M has paid dividends for 98 years and have been increasing the dividend for 57 straight years. Their dividend was last raised by 20% and I am expecting any day now for them to announce the increase for the 2016 year. I may choose to add some more later this week. 3M below $137 will be a buy for me. FastGraphs indicates in the last 20 years, MMM averages around a P/E of 20, which is approximately what it stands today. November has been a relatively inactive month. I have not been following the market as closely this month. My goals are to increase my cash position and to increase my size in utilities when interest rates are raised. It seems that the high yield market is already taking a hit, making many utility companies enter more favorable prices. My portfolio is shown below. A new large addition is Novo Nordisk, a Danish pharma company specializing in diabetes medicine. I have also started a new position in CVS. My portfolio has increased quite decently since last month's summary primarily due to contributions. My yield is a bit on the low side for my taste. I hope that in the coming weeks utility stocks and REITs continue to get hammered so that I can pickup them at attractive valuations. These stocks sport high yields and will help bring my dividends up more. The goal of the portfolio is to own high quality companies, with strong histories of increasing dividends year after year. Quality is incredibly important, I prefer to hold heavily companies with a BBB+ or better S&P financial rating or an A or higher Value Line financial strength rating. The table below show the financial rating scores of my various holdings. Bolded names are companies that are incredibly high quality. My healthcare sector weighting have been increased this last month. They now occupy 1/6 of my portfolio. 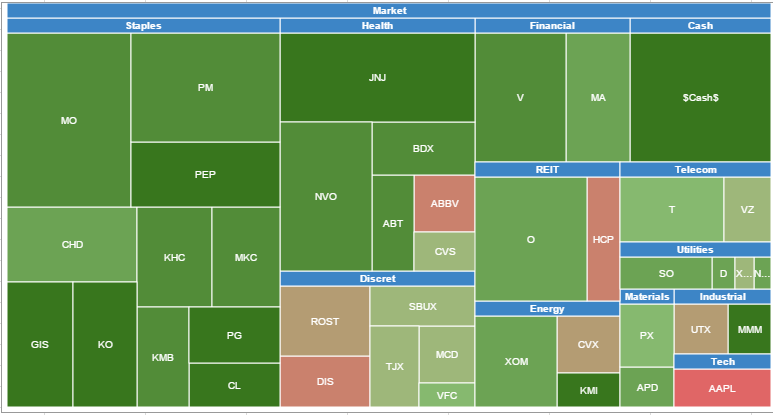 MO, JNJ, PM, O, NVO, V, PEP, CHD, MA, XOM are my 10 largest holdings. In terms of meeting my goals, I am still on track. 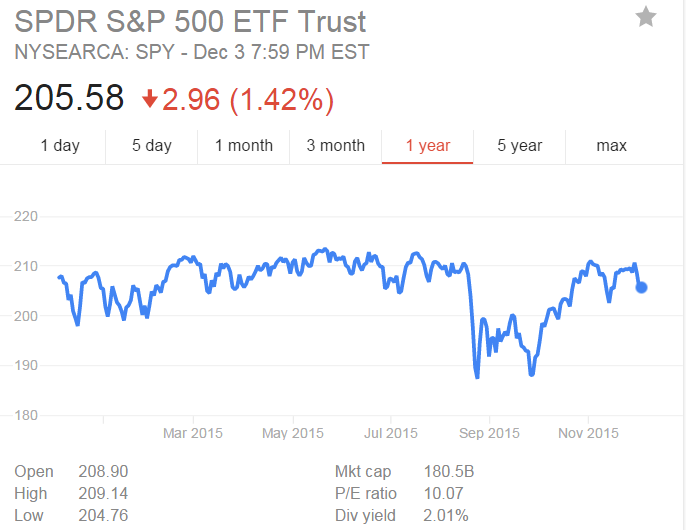 The ride has been bumpy in 2015. 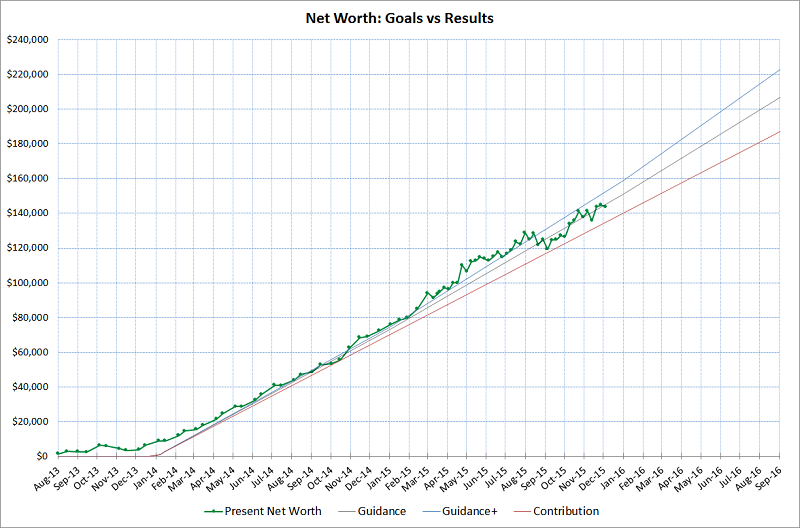 I expect the ride to get bumpier as my networth increases and the fluctuations in the market become much more than the monthly contributions I put into my portfolio.